Gap Inc, one of the most reputed denim apparel retailer , has released its financials for the first quarter of 2017. 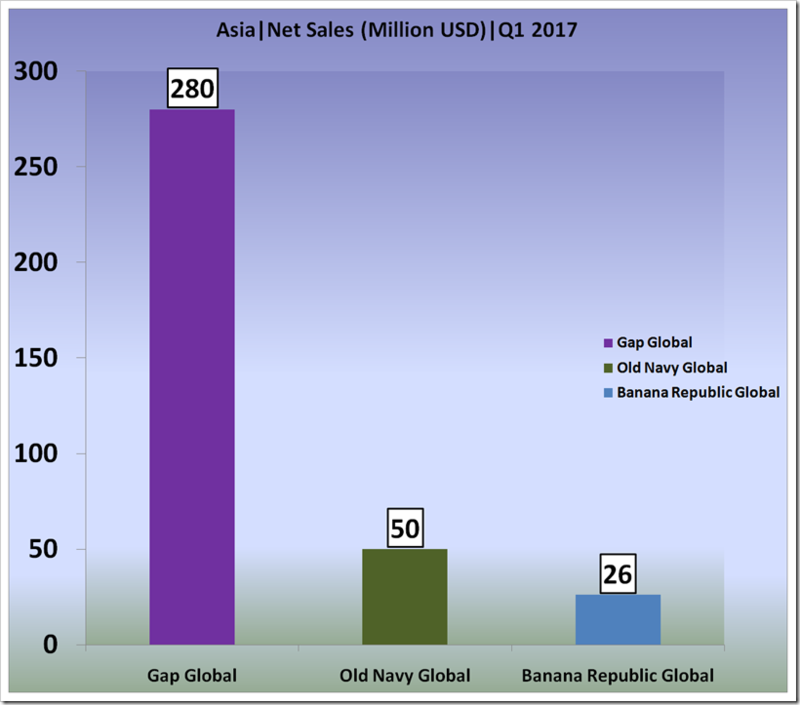 In this report , we have done a detailed analysis of revenue & profit of their brands : Gap Global , Old Navy and Bananna Republic . There is also an analysis on the geographical distribution of the revenue and profit of their respective brands for Q1 compared to same period in 2016. 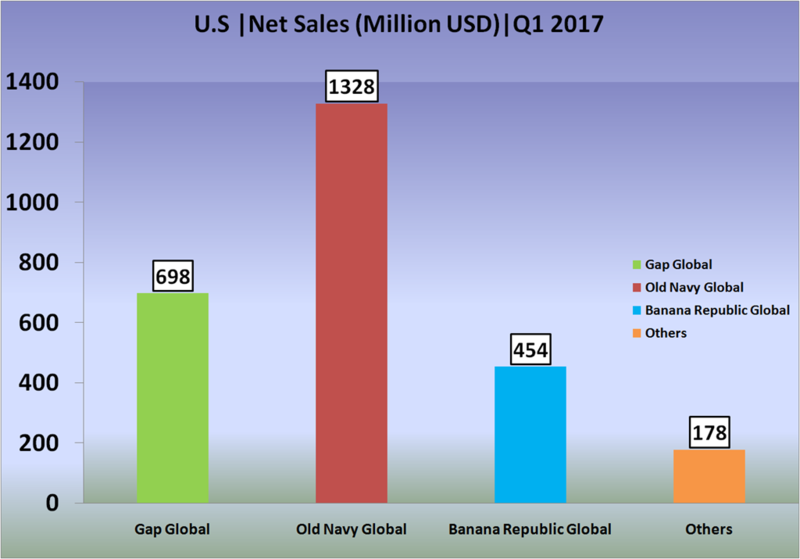 The table below shows the net Sales of The Gap Inc, for 1st quarter 2017 (Million USD). 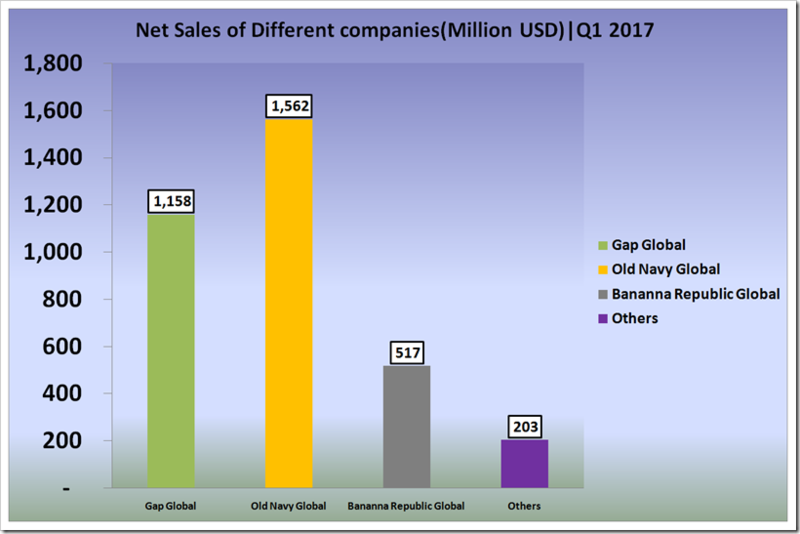 The net sales for Gap Global is USD 1,158 Million , Similarly for Old Navy Global it is USD 1,562 Million , for Banana Republic Global it is USD 517 Million , and for Others it has a net sales for USD 203 Million .Out of total revenue of USD 3,440 Million , USA is leading the charts with the revenue share of 79% in the whole however Europe has merely a share of 4% . 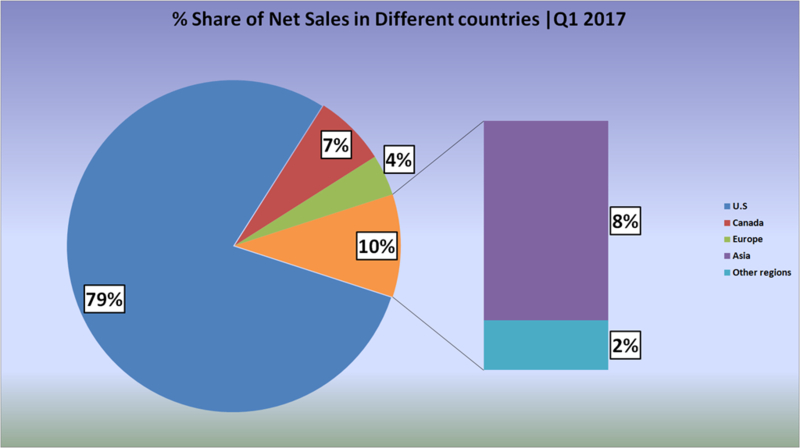 The graph shows the percentage of net sales of different companies in first quarter,2017. 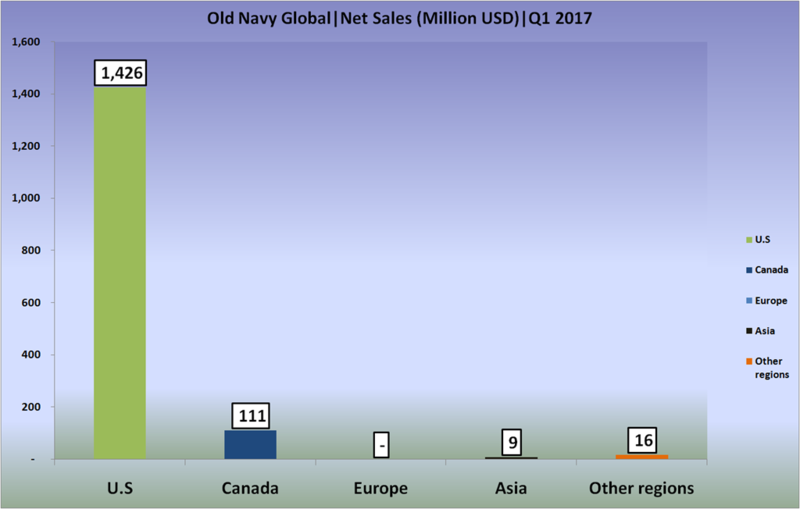 Old Navy Global is a leading which shows a net sales of 45%. 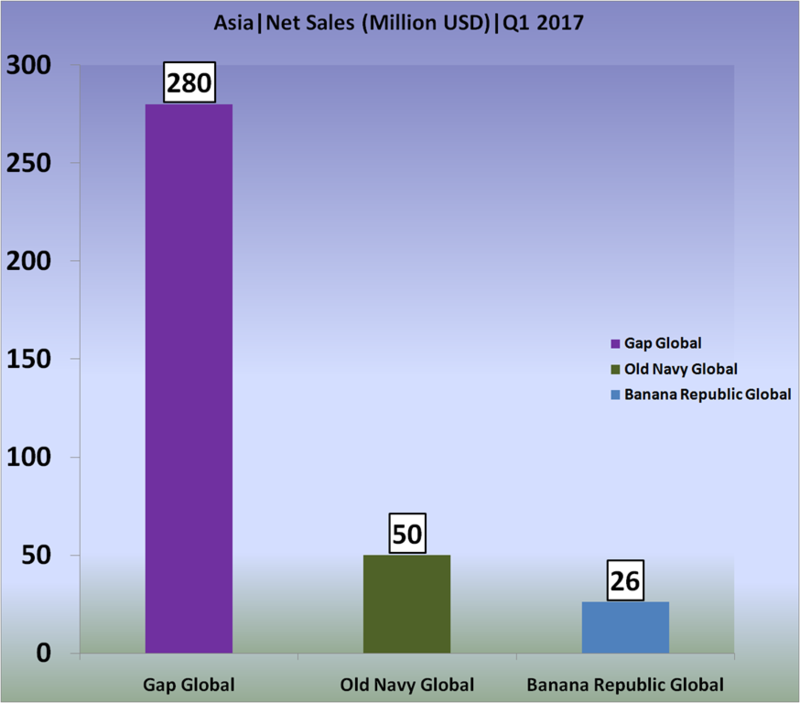 Gap Global shows 34 % of the net sales .Banana Republic Global shows a net sales 15 %. 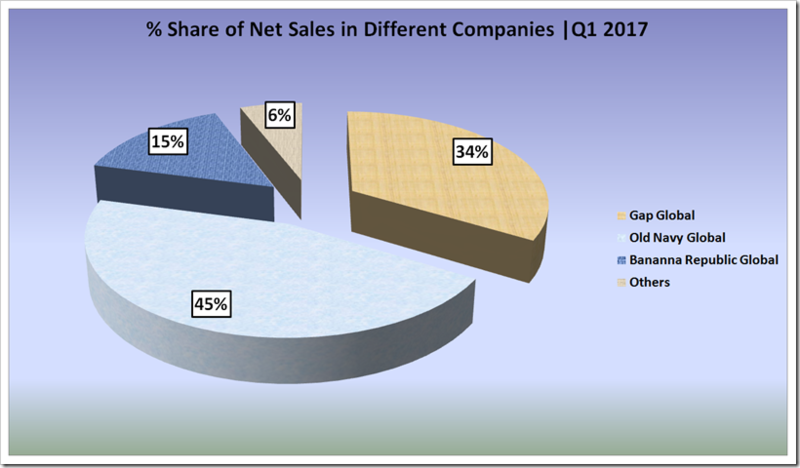 Others shows a net sales of 6 %. 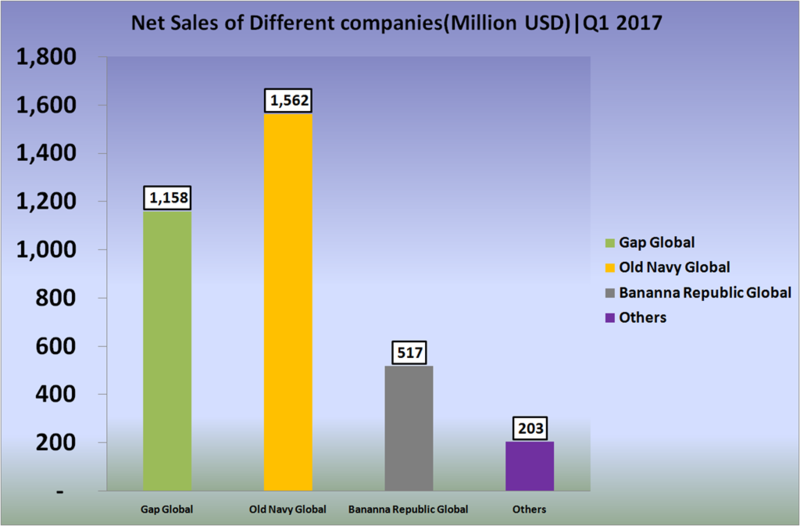 The net sales of Gap Global in U.S is 668 (Million USD) in first quarter . 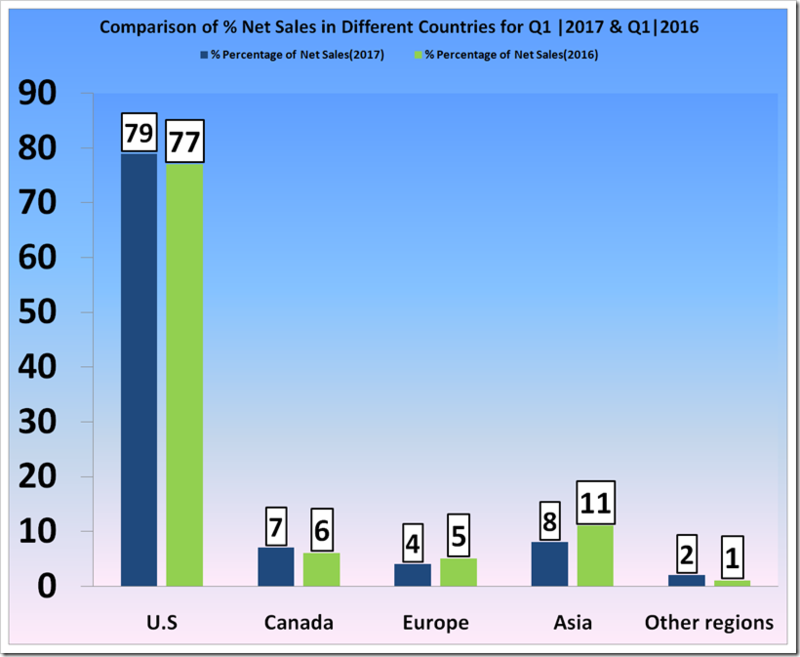 Canada contributes 77 (Million USD) of net sales Europe contributes net sales of 133 (Million USD). Europe contributes a net sales of 133 (Million USD). 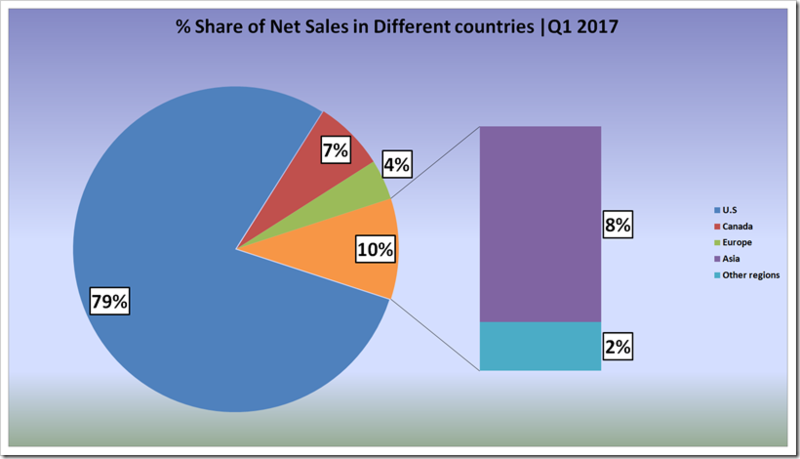 Asia contributes 250 (Million USD) of net sales . 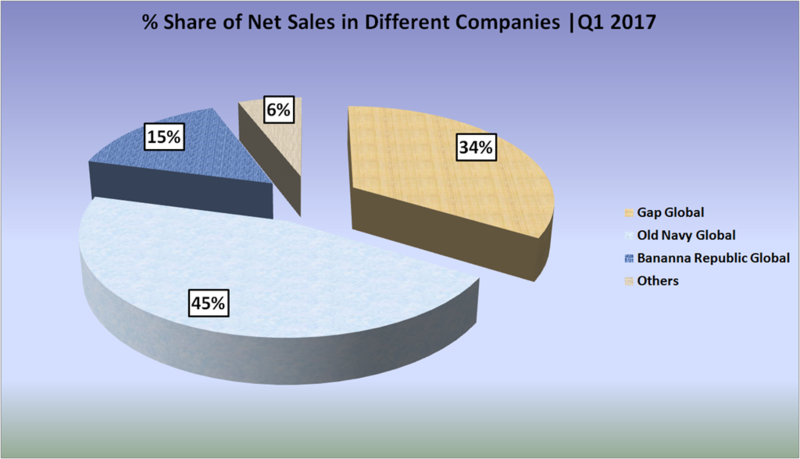 Other regions Contribute 30 (Million USD) of net sales. 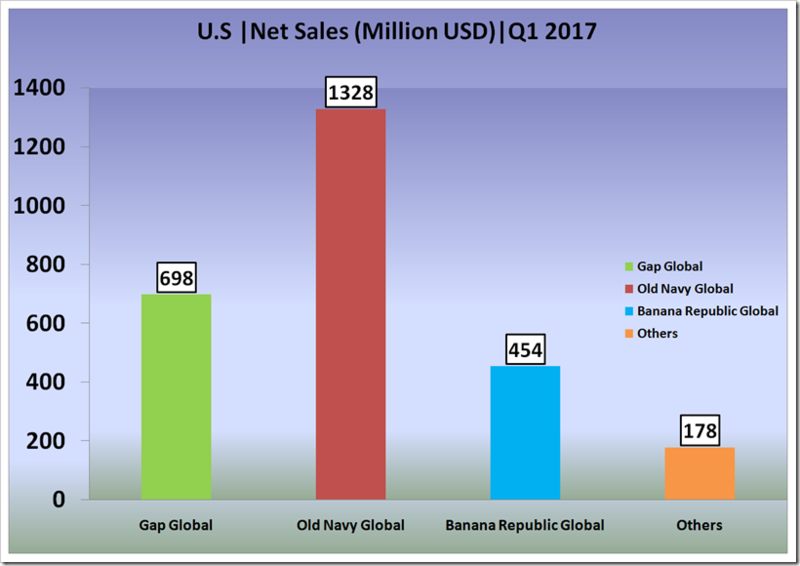 The graph shows the net sales (Million USD) in first quarter,2017 in different regions for Old Navy Global. 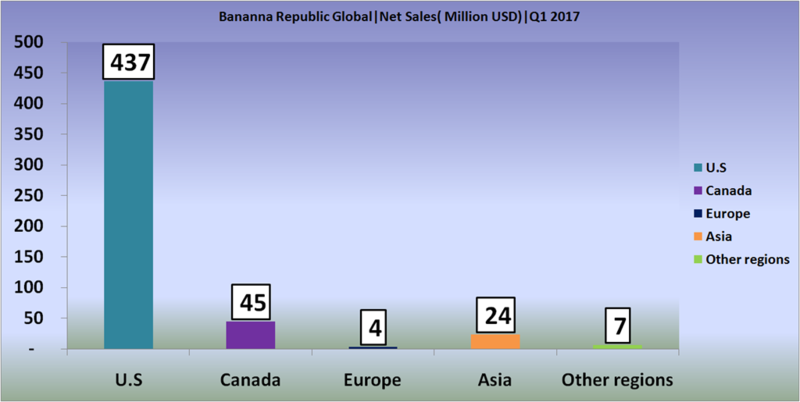 U.S shows a net sales of 1,426 (Million USD). 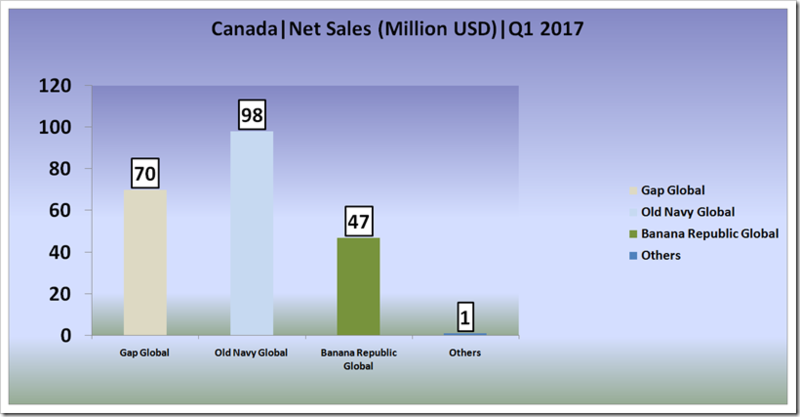 Canada contributes 111 (Million USD) of net sales . Asia contributes a net sales of 9 (Million USD) and Other regions contributes a net sales of 16 (Million USD). 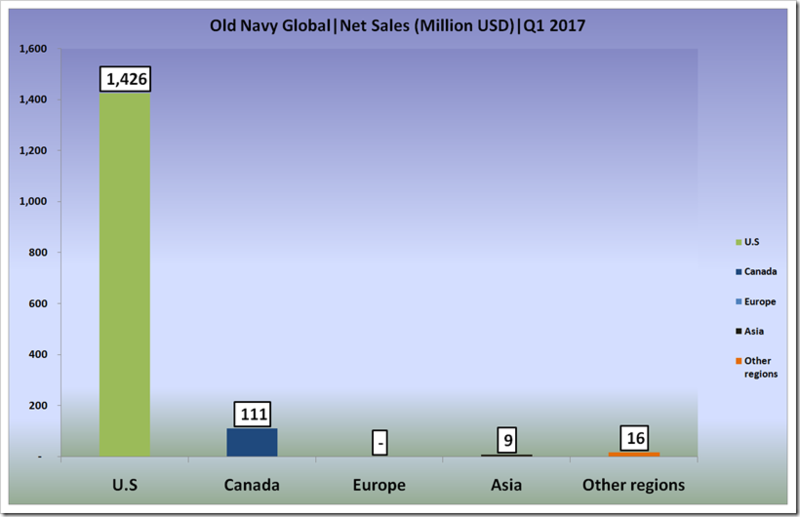 Europe doesn’t have any share in the revenue distribution of Old Navy Global for Q1 2017 . 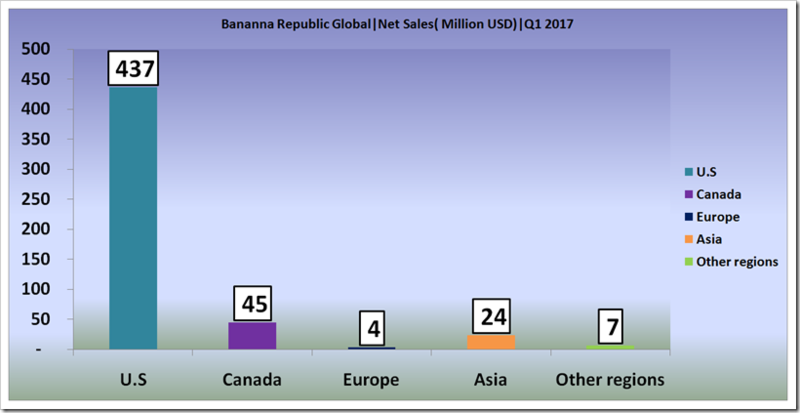 The graph shows the net sales (Million USD) in first quarter, 2017 in different countries for Banana Republic Global .U. S contributes a net sales of 437 (Million USD) . Canada contributes 45 (million USD). Europe Contributes 4 (Million USD). Asia contributes 24 (Million USD). Other regions contributes 7 (Million USD). The comparative study gives many surprising statistics about the ups and downs of Gap revenue coverage over different regions. Sales in USA have growin by 2% however the Asia sales are down 3% and the reason might be the infiltration of many retailers like H&M and Zara which cut down their prices to take over the shares of their competitors. The equations have been changed over the years and for the retailers of mid range denim , the market has become pretty difficult due to low in demand and frequent change in consumer behavior . Recently , H&M achieved the sales of USD 120 million in India within 6 months of starting operations and that too with handful stores which is very encouraging however it sets the balls on rolling for such markets. 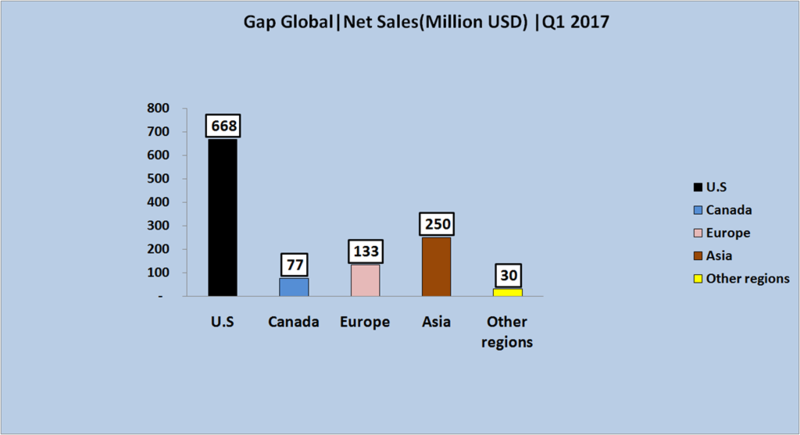 It seems that GAP is not able to perform in any other market except US and this is perhaps the reason for its almost static sales. The company will have to devise strategies to be present in a stronger way in these markets as most of the growth is happening in Asia and GAP is currently kind of lost in these markets. 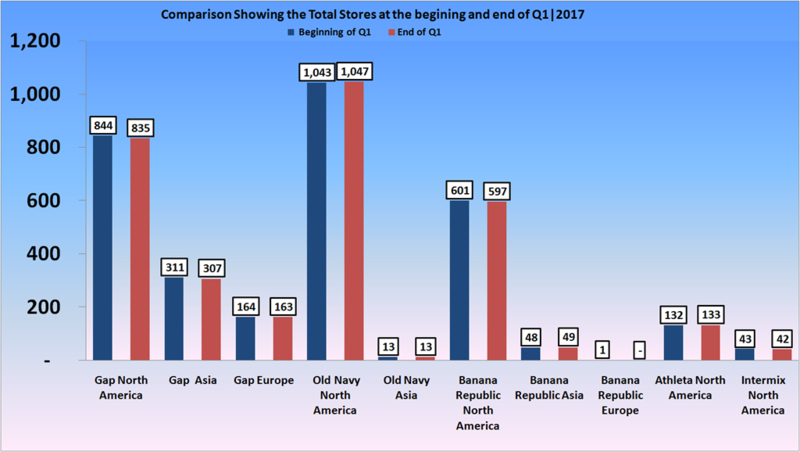 Gap Global as a brand has lost its share if we compare with the Q1’16 . 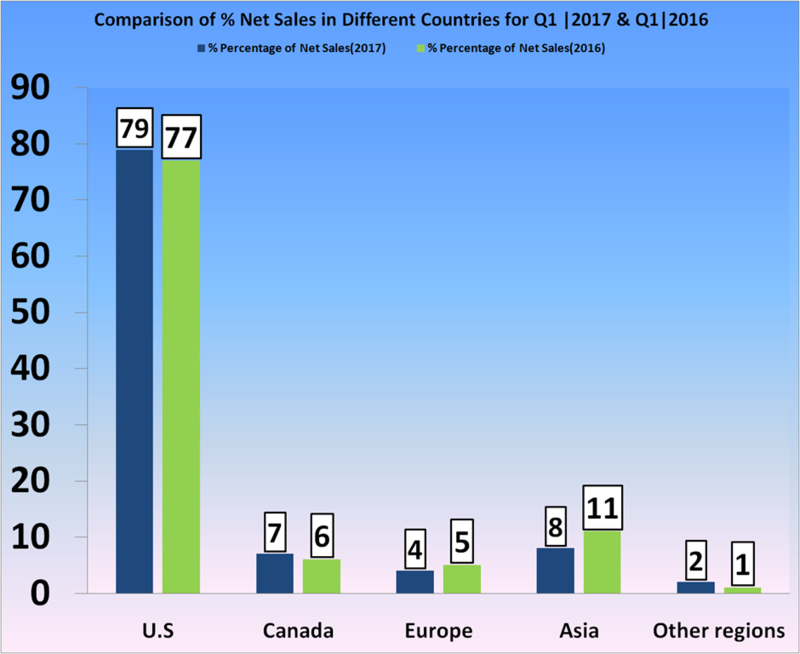 In Q1’16 , the net sales were USD 1,223 million which came down to USD 1,158 in Q1’17. 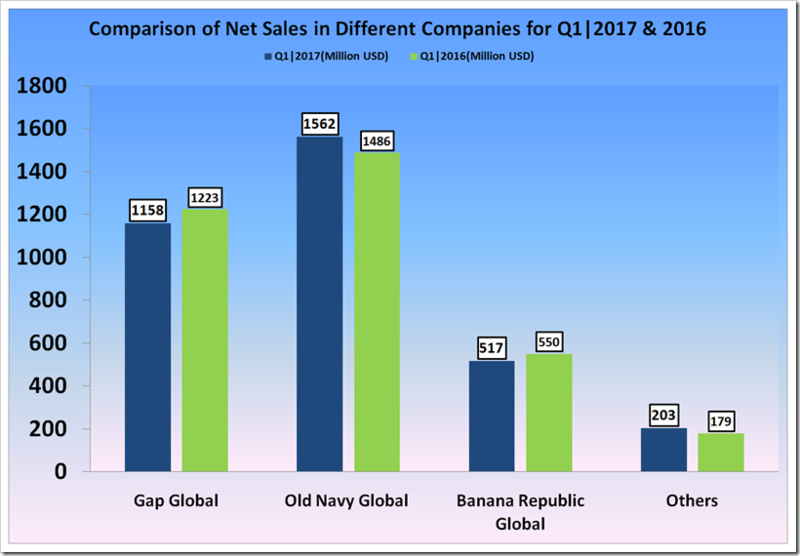 Old Navy has some positive changes from USD 1,486 million to USD 1,562 million in Q1’17 . 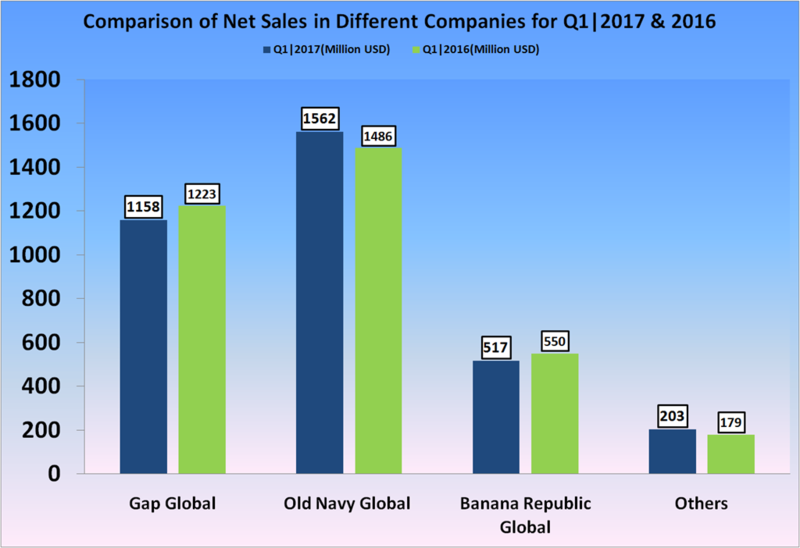 Banana Republic also lost its share marginally from USD 550 million in Q1’16 to USD 517 million in Q1’17 . On the whole it was a almost static sales but the good news is that Gap sales did not fall significantly. Within a span of 13 weeks , the company has closed 23 of its stores worldwide however opened only 9 . 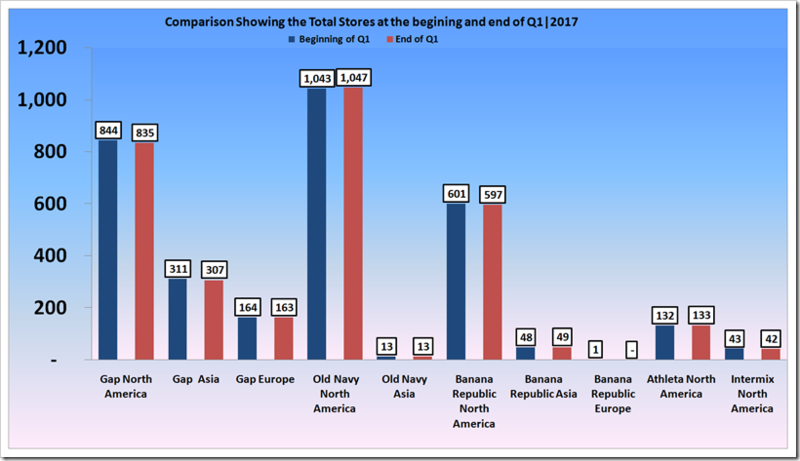 Gap North America is the biggest looser with 9 closer of stores followed by Gap Asia with 6 . 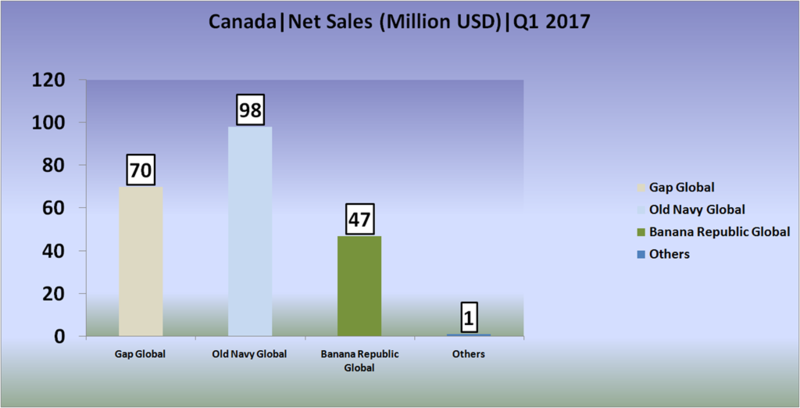 Old Navy North America seems to be growing as they have five new stores while only one store which has been closed during this quarter . With a Total stores of 3200 in the beginning of Q1,17 , the company is left with 3186 stores at the end of the quarter which includes 23 closer and 9 new additions to fleet . Gap Inc. is a leading global retailer offering clothing, accessories, and personal care products for men, women, and children under the Gap, Banana Republic, Old Navy, Athleta, Intermix, and Weddington Way brands. 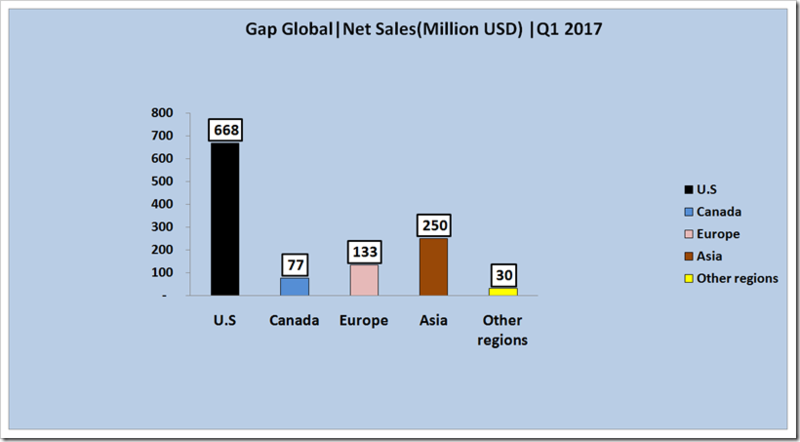 Gap Inc. products are available for purchase in more than 90 countries worldwide through about 3,200 company-operated stores, about 450 franchise stores, and e-commerce sites. For more information, please visit www.gapinc.com. 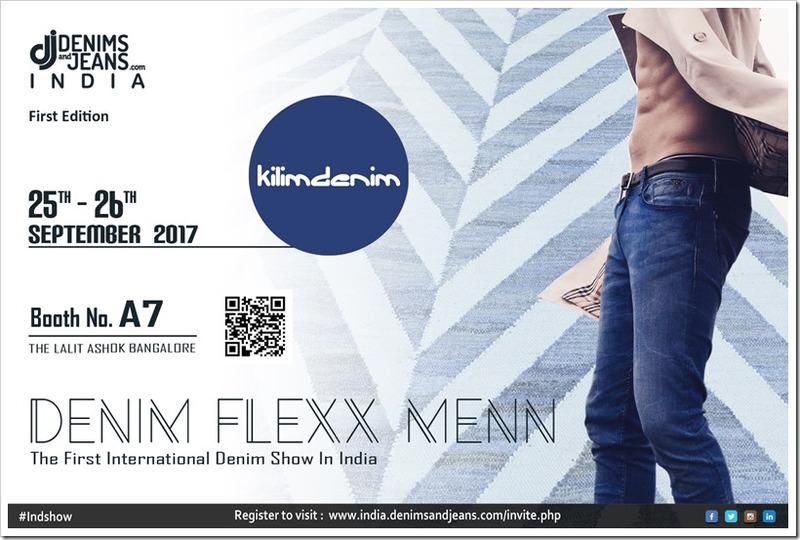 Welcome KilimDenim From Turkey at the First Edition Of Indian Denim Show by Denimsandjeans India . The Show is scheduled on September 25-26 at Hotel Lalit Ashok , Bangalore . 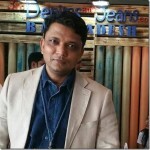 Please register at https://lnkd.in/fvsdfak to get the official invitation of show .